Arsenal boss Unai Emery intensified his power battle with the squad’s highest earner Mesut Ozil on Friday by insisting he will only pick the players who show the most commitment. Emery left Ozil out of Arsenal’s Carabao Cup defeat by Tottenham on Wednesday, having previously dropped him to the bench for Premier League matches at Bournemouth and Southampton. Ozil signed a three-and-a-half-year contract with the club last January on a reported £350,000-a-week salary. But following the departures of manager Arsene Wenger and chief executive Ivan Gazidis, Ozil’s position has significantly weakened. Emery put Ozil’s omission at Bournemouth down to a lack of ‘physicality and intensity’ and he expanded on that on Friday. 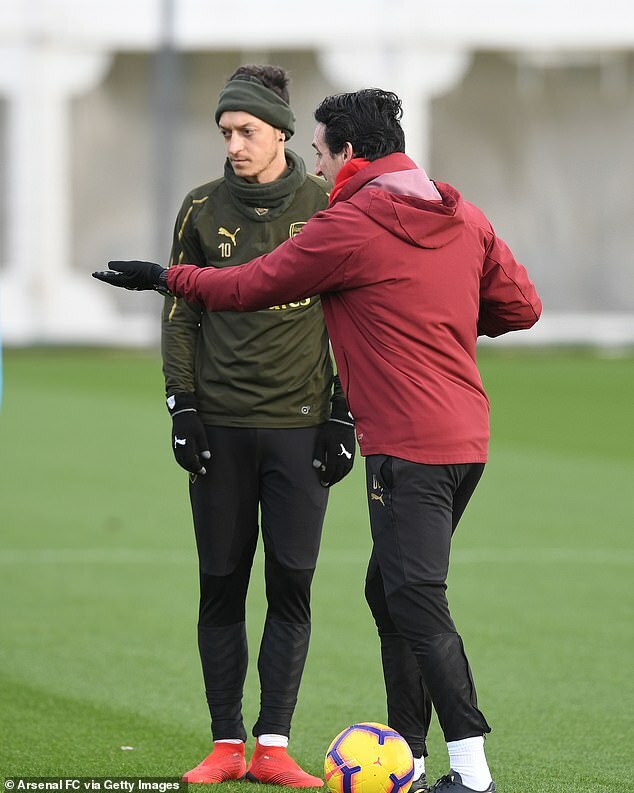 During his most compelling press conference as Arsenal manager, Emery urged Ozil, 30, to improve his mentality, exert himself in training and offered mixed messages about the player’s future. It has been reported Arsenal are open to selling or loaning out Ozil next month. When it was put to Emery that it is unusual for a club’s head coach and costliest player to be at odds, Emery said: ‘In some matches, we need different things tactically and individually. ‘It’s not only for him. For me, the player’s salary is not important. Every player, I want to give them the same conversation or the same chance to play or not play. ‘The most important thing for me is the commitment. If you are asking if this is different because one is with more salary and the other is less salary, for me it’s the same. ‘The most important thing for me is to be OK training every day with good behaviour and good commitment and giving us their quality. Emery conceded that Ozil would be frustrated to miss out. ‘Every player wants to play and to help the team,’ he said. However, when speaking later to newspaper reporters, Emery refused to be drawn on whether Ozil could be sold or loaned out in January. ‘I am not thinking about this situation,’ he said. Emery then suggested Ozil’s style may not suit playing with Arsenal’s strike pair Pierre-Emerick Aubameyang and Alexandre Lacazette. ‘When you play with two strikers, then it is difficult to play with a No 10 player,’ he said. Ozil is expected to return to the team for their Saturday lunchtime home fixture against Burnley, but Emery will probably drop the German for the challenging visit to league leaders Liverpool next weekend. Emery also confirmed his team will be training on Christmas Day ahead of the Boxing Day fixture at Brighton, but the Spaniard will allow the players to eat with their families the night before the game. ‘I had 10 days of holiday this time last year at Paris Saint-Germain!’ Emery joked.